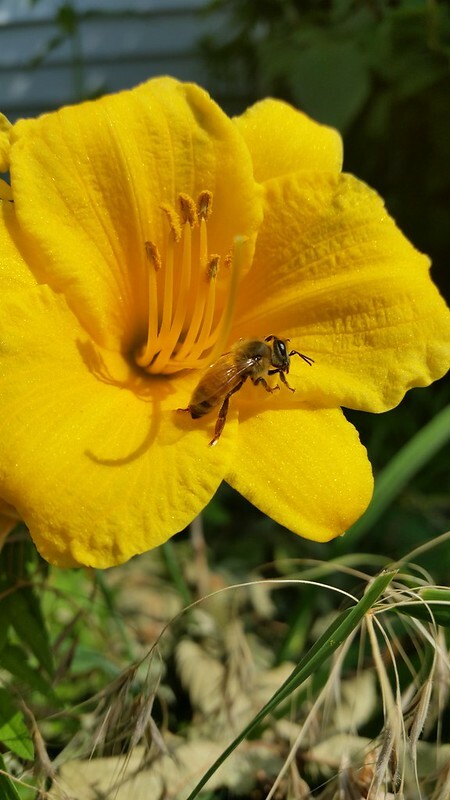 A bee making its way to the flower's pollen. Sometimes, it's just a matter of noticing and focusing. I hadn't anticipated I would see this particular sight when I set out for my walk but there it was; a bee getting all friendly with the flower. I actually saw it out of the corner of my eye and almost kept going and then realized--oh wait! Now there's something to capture! I was surprised that I got the camera on the phone ready and pointed before it took off. However, it wasn't until I got home to see the photo on a computer monitor that I was even more impressed with the quality of my phone's camera. The texture of the flower is so vivid and its reflective specks that cover it I never knew were there. The flower's center is almost alien, looking like alien tentacles reaching out to explore the world around it. The bee is pretty cool to look at closely as well. I've had many a bee-sting in my life but in looking closely at this guy on the flower, I do find him plenty cute.